What Difference Does A Million Here And A Million There Make When You Don’t Have That Million? Last October, heads turned when it was publically revealed that SCSU had a projected $9,542,000 deficit for FY15. This was especially disconcerting when the previous March, a budget projection said that the FY14 budget was balanced. A question that has never been answered by the administration is how you can go from a balanced budget in FY14 to a deficit of $9,542,000 the following year—without, of course, there being a cataclysmic event? I am just wondering if I missed something? The document also showed for FY16 the loss of 76 FYE faculty positions and 50 staff positions. Additionally, the document showed that the deficit for FY15 is projected to be $10,284,000, which is $742,000 or 7.8% larger than the deficit projected last October. Another surprise showed up in the document; the FY14 deficit was $11,840,000, which is quite a bit larger than the $708,000 cited by President Potter last fall. According to this document, the expenses for FY16 are going to be reduced by $12 million. There are many things that I have been happily ignorant of at SCSU. However, I think that I have closely followed SCSU’s budget/enrollment situation. This is the first time that I have heard that the cuts for the FY16 budget have been increased from $9,000,0000 to $12,000,000. When you are dealing with such large numbers, what’s another $3,000,000? Unfortunately, an increase of $3,000,000 is an increase in the planned reduction by an additional 33%! When the narrative for the SCSU’s Financial Recovery Plan was submitted, the FY16 deficit was reported as between $10,000,000 and $12,000,000. The precise size of the projected FY16 deficit will change over time as new information becomes available. When the Financial Recovery Plan was presented, it was understood that the administration wasn’t going to try to eliminate all of the deficit in one year because it would be attempting to cut too much at one time. Five years ago, the administration cut $14,500,000 from the budget and enrollment declined 6.9%, 5.3%, 5.1%, and 5.0% in the four years following the cuts. It was not surprising that the administration was only planning on cutting $9,000,000 when the deficit was between $10,000,000 and $12,000,000. Now it appears that the ‘decision makers’ have decided to increase the amount of cuts from $9,000,000 to $12,000,000. Why is this important? The original budget cut of $9,075,000 projected the loss of 76 FYE faculty positions and 50 staff positions. Now with the budget cut increasing to $12,000,000, this may translate into the loss of an additional 25 FYE faculty positions and an additional 16 staff positions. This will affect lots of people. It’s a big deal! 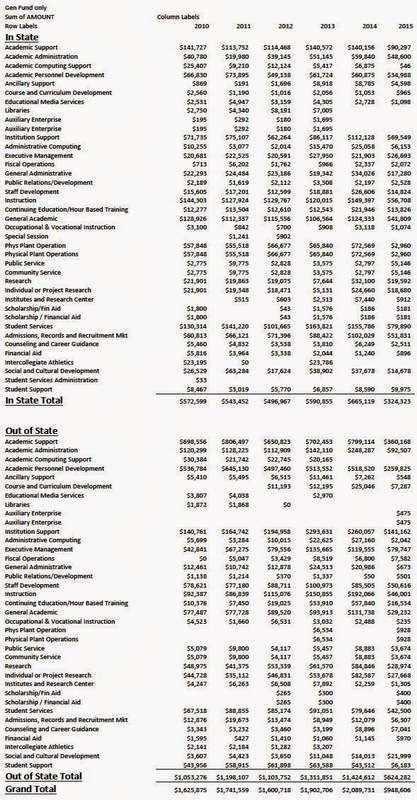 The administration’s budget information, which was released as part of SCSU’s Financial Recovery Plan that was submitted to MnSCU (reproduced above), shows that even with a cut of $9,075,000 in expenses, there is still a projected deficit of $679,000 in FY16. The latest budget document that has been circulated projects a deficit of $12,378,000 for FY16. Apparently, the FY16 deficit has increased from $9,754,000 ($9,075,000 + $679,000) to $12,378,000, which represents an increase of $2,624,000 and corresponds to an increase of 26.9%. Concomitantly, the cuts have increased from $9,000,000 to $12,000,000. Unfortunately, the lack of communication and lack of transparency continues, on the part of the administration, as it appears that this increase in the deficit and the increase of the amounts of cuts have not been widely disseminated across the campus. 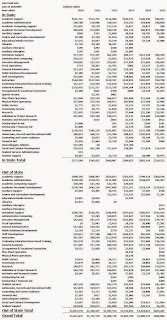 (Budget cuts corresponding to $12,268,000 were revealed by Vice President of Finance and Administration Tammy McGee at the Budget Advisory Group meeting on April 24, 2015). It has often been heard around the campus that the cuts will amount to a reduction of only 5%. The problem is the budget documents show that SCSU’s General Fund projects a deficit of $12,268,000 on a General Fund Revenue Total of $144,421,000. As a percentage, the deficit is 8.5%, which is considerably larger than the 5%. Additionally, since there are a number of fixed costs that cannot be cut and must be paid. Bond payments must be made, buildings need to be heated and lighted, water needs to come out of the faucets and contracts must be honored. Deciding to not pay the electric bill is probably not a successful long-term strategy. Because fixed costs and contractual costs can’t be cut easily, the cuts in other places will necessarily be larger and more in the range of 10%. Almost everyone on campus knows that the budget axe is going to fall and it’s not going to be pretty when it hits. A review of the unit plans for budget reduction uniformly predict dire consequences if 10% reductions occur. It is also known by almost everyone that you can’t cut $12,000,000 (or $9,000,000 for that matter) and not at the same time cut programs and services that are generating revenue, which is clearly in conflict with the fourth bullet point of the Principles/Assumptions. However, the assumptions document, as written, appears to prevent cutting money loosing revenue generators (i.e., some activities generate $0.27 of revenue for every dollar expended). What needs to occur is an increase in the margin between revenue and expense for the campus as a whole. A focus only on revenue leaves a false impression that revenue needs to be preserved, however, increasing revenue production that costs more to produce than the revenue generated results in larger deficits not smaller deficits. Anything that reduces revenue simply ‘kicks the can down the road’ because it will increase the deficit and will lead to additional cuts in subsequent years. Unfortunately, class sizes can’t simply be increased enough to overcome SCSU’s structural deficit. The information shows that the administration paid $1,600,718 for travel in FY12, increasing to 1,902,706 in FY13 and increasing again to 2,089,731 in FY14. 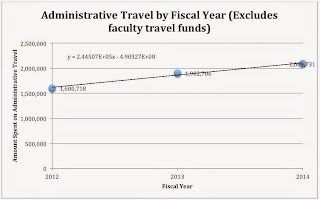 It is important to know that this data does not include faculty travel because it is not paid for from the general fund budget. The data for FY15 is not complete but it would be a safe bet that the total is going to be in the same range or higher than in FY14. The Faculty Association had asked for the travel expenses broken down by individual to see who is travelling at university expense, along with the reason for the travel, and just how much it is actually costing. The document received from the administration gives the travel expenses in such a way that it is not possible to see how much President Potter and others have spent on frequent trips out of the country. Clearly, some out of state travel has the potential to increase enrollment and revenue. However, not all travel has an equal potential for revenue enhancement. In fact, it is entirely possible that enrollment may go up but still lead to a negative return on investment. It does not need a banner hung over University Avenue to know that enrollment at SCSU has been declining. Enrollment for FY12, FY13, and FY14 correspond to enrollment declines of 6.9%, 6.4%, and 5.1%, respectively. From the data from the administration, it is clear that the enrollment decline is decreasing as the administration spends more money on travel. Let’s look at the data in a more quantitative way. The linear regression line is shown. 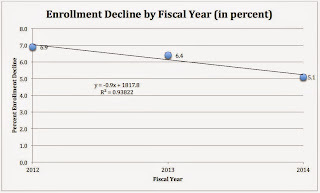 Using the equation for the linear regression line, it is possible to calculate when the percent enrollment decline will eventually reduce to 0%, which means that the enrollment is no longer declining. The calculation yields that the enrollment decline will reach 0% during fiscal year 2020 (2019.8). The data shows that if the administration expends $15,433,000 on travel during the next five years, the enrollment decline will be reduced to 0%. 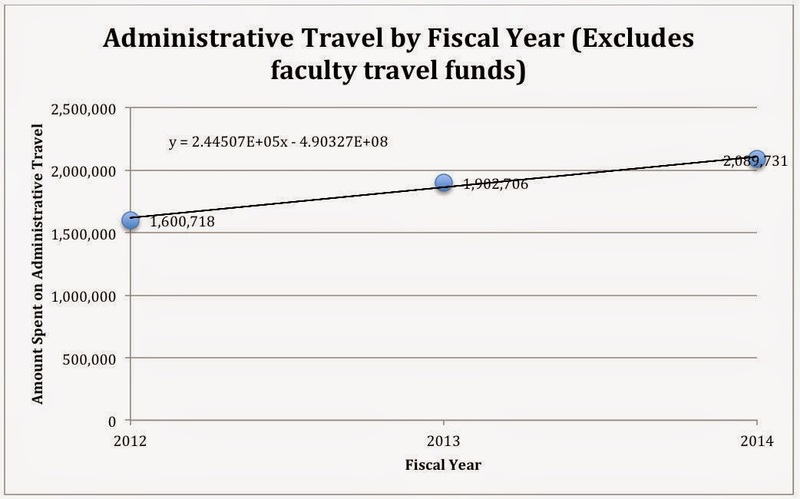 If even more money is spent on travel, presumably the enrollment will turn around sooner! I hope that anyone with even any knowledge of university finances will recognize that this argument about travel expenses and enrollment decline is not really serious. However, what is serious is that SCSU has to cut the budget for FY16 by over $12,000,000. Genius idea. Let’s stop all administrative travel unless it is directly related to increasing enrollment that will result in a net gain in revenue. In this way, essentially all travel will literally fund itself. This strategy may save SCSU over $2,000,000 per year and it will probably result in increased enrollment. At a time when the budget is being cut by $12,000,000, a ‘painless’ $2,000,000 savings would almost seem like a ‘Christmas miracle.’ At this time, SCSU needs one.